Minerally and fresh with garrigue florals, wet stones, and marine salinity. Fresh lime, white peach, and pear on the palate with the minerals, fresh acidity, touch of iodine, and garrigue. A very long finish. Pair with fish, shellfish, sushi. Jean-Claude Masson enjoys his jet skis and race cars, but he is a most serious winemaker. His young white wines are electric and forceful. These wines will age gracefully as well, so don't be afraid to hold on to them for a couple of years. 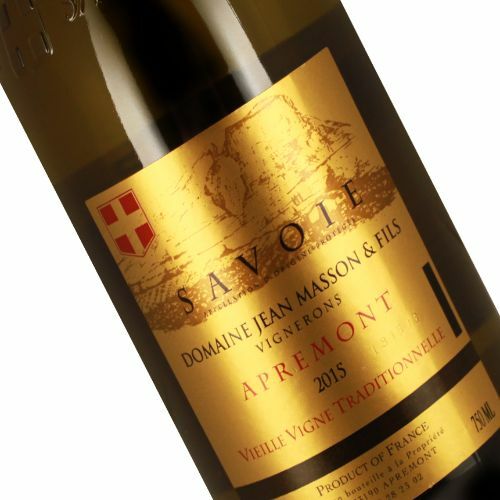 Masson's vineyards are located in the commune of Apremont, at a very high altitude on limestone soils speckled with stones. The (9) hectares of vineyards are mostly planted with Jacquere, a white grape variety yielding crisp, minerally wines. A secondary grape Altesse lacks Jacquere's complexity, but is fun and easy drinking - perfect for a picnic.